A version of this article originally appeared on FoodBeast.com 3/6/19. Cannabis and CBD-infused foods are becoming more popular as legalization spreads across the nation. Companies like Coca-Cola are even taking the edible trend into consideration as fervor continues to spike. As a result, other compounds derived from cannabis are also getting attention for their benefits and potential usage in food. A particular category coming into the spotlight more frequently are terpenes, which are aromatic oils found in foods and plants. Terpene extracts have no psychoactive effects and can be derived from either the cannabis plant itself or extracted from foods and sold in concentrated form. While terpenes are found in a variety of plants other than cannabis, their effects on mental health and the psychoactive experience have made them part of the conversation. Lagunitas has already collaborated on a sparkling beverage combining hops with several terpene profiles to put a new spin on the adult-beverage category. This usage of terpenes has continued in the pop-up dinner scene, where these extracts are often used to elevate the experience through an approach similar to wine pairings with coursed dishes. A recent Foodbeast x Blüm Cannabazaar dinner was a strong example of how the two pair together for a heightened culinary affair. The meal was prepared by Chef Luke Reyes, known for his low-dose and infused meal experiences put on by cannabis catering and events firm La Hoja. Reyes sourced a “Lemon Haze” terpene extract to pair with the limonene and myrcene profiles found in Canndescent’s “Connect” flower. Reyes added this terpene extract as a part of a unique take on ranch dressing. Chef Reyes’s dish was an elevated version of buffalo wings, with buttermilk fried Cornish game hen playing the role of chicken. 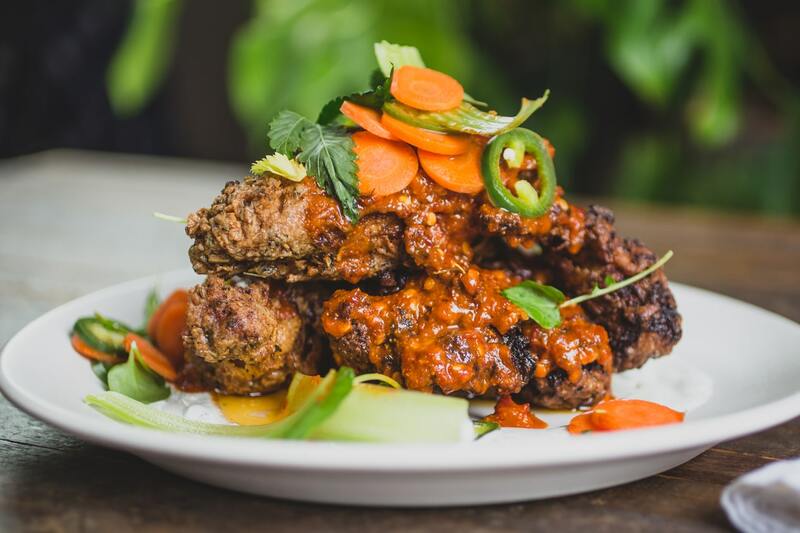 Those wings were tossed in a fermented chili hot sauce and garnished with the terpene-infused ranch and garnished with a salad featuring pickled celery, carrots, and fresh cannabis leaves. The “Lemon Haze” terpene was paired with the dish because of its citrus notes and calming effects. It’s an interesting ingredient to add, since the compound has been reported to be beneficial, even if it’s not taken alongside cannabis. One could describe this as “culinary aromatherapy,” since inhaling those scents during the meal enhance the overall experience. Limonene, for example, which is found in lemons, has been shown to elevate a person’s mood. In the case of the Cornish Game Hen wings, the aromas from the “Lemon Haze” terpene combined with the fried chicken was a pairing of comfort food and heightened relaxation, making folks feel content and chill at the focal point of the meal. Moments that incorporate this type of aromatic experience are starting to gain some traction in the world of food, and rightfully so, considering fine dining is an all-encompassing sensory experience. Regardless of whether it be with cannabis or not, we may start seeing more terpene dishes and drinks in the future. Constantine's life revolves around eating, studying, and talking about food. He's obsessed with eggs, gyros, and the future of food.